Whether you’re in an area where the snow is starting to fall, or you’re running out of daylight, it’s the time of year when many athletes shift some of their training indoors. No matter if you’re using a stationary trainer, rollers, or a spin bike, these indoor sessions can be a great way to keep your fitness and motivation high during the winter months. While these workouts may not be the ones you dream about, they are beneficial to your overall training. Mental preparation is the first step in making these indoor sessions a success. It also helps to have a few workouts that can be your go-to’s when time and motivation are running low. 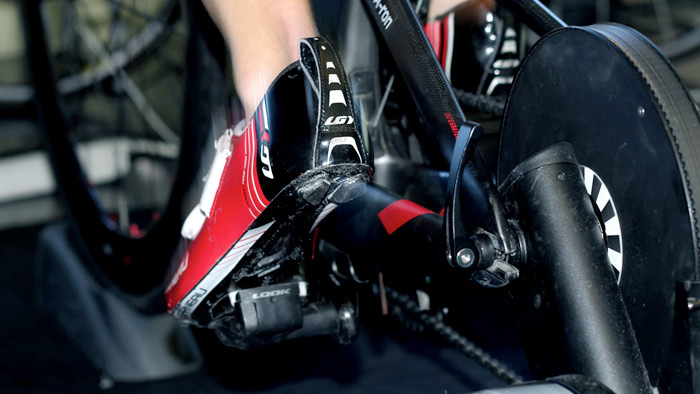 With a little preparedness indoor rides can be a chance for you to develop as an athlete, instead of a dreaded part of your training. While riding indoors doesn’t top most people’s list of favorite activities, there are a few things you can do to make it more enjoyable. One of the best approaches is to prepare yourself mentally by not comparing your training indoors to your outdoor rides. We all love those beautifully sunny spring rides when everything is right with the world, but the truth is that the trainer is nothing like that, so don’t set yourself up for failure. Settle in to the idea of training indoors, and focus on the task at hand. Sometimes there’s no replacing volume, but if it’s possible, try to shorten your workouts by decreasing the overall time and adding more intense interval work. These shorter, harder efforts can be a great opportunity to hone in on any weaknesses and develop problem areas that may get neglected during the season. Breaking up your ride with intervals is not only great for athletic development; it’s also a great mental cheat to make the time go by faster. Lastly it helps if you have everything you need for your workout set up and ready to go. A dedicated space for your trainer and any other equipment you need puts you a step ahead when it’s time to ride. Take the time to organize your “pain cave” so that when it’s time to workout you have one less excuse to keep you off the bike. Now that you have everything set up and you’re mentally prepared for your indoor session, it’s time to decide what workout to do. The following three workouts provide a well-rounded approach to your sessions, and focus on key developmental areas including endurance, Functional Threshold Power (FTP), and Functional Reserve Capacity (FRC). While having access to power data and in depth software like WKO4 and Training Peaks is helpful, all of these can be done using heart rate or perceived effort. This is a great workout to push your aerobic system and continue to develop endurance without the typical long endurance ride that may be harder to do in the winter. You can extend the “threshold” section of this workout to further increase gains. Perform a long warm up of at least 20 minutes. Then complete 45 minutes at the top end of your zone 2 range, keeping your cadence and breathing comfortable. The goal is to push the pace without bleeding over into tempo or threshold zones. After the 45 minutes is up continue riding at the high end of zone 1 or low end of zone 2. This workout usually lasts 1:45 in total, but it can be extended as needed. Your “sweet spot” is roughly 85 percent to 95 percent of your Functional Threshold Power (FTP) or your tempo zone when using heart rate. Time spent in your sweet spot allows you to still push your FTP without accumulating the training stress of threshold and VO2Max efforts. The sweet spot interval will vary based on the athlete but I like to start by prescribing 30-45 minutes in this zone. After at least a 20-minute warm up in zones 1 and 2, perform 30 to 45 minutes in your sweet spot zone. After the interval you can continue to ride for as long as you’d like at endurance pace. If the longer effort isn’t your strength, you might try breaking up this workout by completing a few shorter duration (10 to 20 minute) intervals throughout your ride. Be sure to allow for ample recovery between sets. Functional Reserve Capacity is like your anaerobic battery. The bigger that battery is, the more work you can do above your FTP. Using your FRC in conjunction with maximum power (PMax) is a great way to track anaerobic gains and help classify an athlete’s strengths and weaknesses. Depending on the athlete’s ability FRC intervals may range from 10 seconds to several minutes. Typically if you’re stronger for shorter durations your FRC will be higher and vice versa for longer durations. If you’re using heart rate these intervals should be above your threshold but below VO2Max. Allow for an ample warm up that includes several 30 to 45 second high cadence drills and lasts at least 20 minutes. After your warm up, complete 10×35 seconds at FRC range with 2 minutes in Z1 between. Adjust the interval length as necessary based on your strengths as a rider. These should feel “comfortably hard” but are not designed to be all out efforts. Your time spent indoors doesn’t have to be dull. If you take the time to prepare properly and get into the right mindset it can be an extremely fruitful part of your training. Identify your problem areas and use your indoor sessions as an opportunity to strengthen those areas, as well as further develop your strong suits. Having a few go-to workouts that you can adapt based on your fitness and available time make it that much easier to get in the work. The goal should always be to provide yourself with as few barriers as possible to completing your workout. By shifting your expectations and setting yourself up for success, this winter can be a season that leaves you with fitness gains and a new perspective on training indoors. Taylor Thomas is the owner and founder of Thomas Endurance Coaching. He has more than a decade of experience in the bicycle industry as an athlete, coach, race promoter, and team organizer. As a USAC and TrainingPeaks Level 2 Certified coach he's helped athletes at every level prepare for and reach their goals in road, mountain, and cyclocross. Browse his pre-built training plans on TrainingPeaks, or for more information on personal coaching and custom training plans visit www.thomasendurancecoaching.com. Follow him at @endurance_coach.